But for the sake of this week’s theme, I have decided to focus on pet peeves, rather than pet peeves. As de facto mom to plenty of household pets over the years, I definitely have issues with my four-legged (well, also a 2-legged) beasties. Let’s start with Bridget, our pound pooch (note the glowing blue eye and half-brown/half-blue eye). 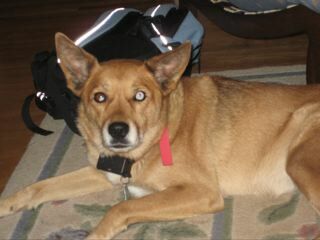 A cross between a Husky and an Australian cattle dog, Bridget looks most like a dingo, from which she is descended. And acts like one too. We had to work hard to tame the beast in her when she was a pup—we’d been advised by the vet a month after bringing her home to get rid of her because of her wild nature. But with three young kids who had bonded with the puppy, and with an underlying lifelong commitment to any pet once we bring it home, we didn’t see that as an option. So early on we had to teach Bridget to be submissive. No small challenge for a dingo dog who’d been tossed with her litter mates along the roadside at the ripe age of one month. Clearly she was a survivor, and survival meant dominance. But now that she was in the cushy confines of suburbia, she had to learn that dominance wasn’t going to fly. We spent a lot of waking hours laying on the dog, picking at her paws, face, putting our fingers in her mouth, even just staring at her. Proving that she wasn’t going to be the boss. She hated it. We soon called Bridget the Pick-up Truck Dog Living in the Mini-Van World. This because she was far more apt to be the dog you see in the back of a beat-up Ford truck tooling down the highway (wondering what the hell would happen if they hit a bump too hard) than domesticated in our mundane backyard. Bridget was not content to remain in our mundane little backyard, however, and soon learned how easy it was to escape. We once spent a week on a ranch riding horses, and while the horses would do a 20-mile trail ride each day, the dogs who tailed along did loops around the horses and probably did 80 miles easily. That’s the energy that Bridget has within her genetic make-up. So when Bridget began to run away, she would run as fast as a gazelle and no amount of persuasion, Scooby Snacks, threats, anything, would convince her to return until she was good and ready. And when she came back she carried with her the stench that a perfect dog day ought to smell like. Alas, our neighbors were not content to have a Kujo-facsimile dog roaming menacingly amongst them, despite her truly being a sheep in wolf’s clothing (well, discounting that dominance thing). This meant having to purchase the “stubborn dog” collar for the electric fence—the same one our friends once had to secure around their boxer’s gonads to keep him from escaping. We hated the idea of power-zapping the dog, but figured it would be far worse if she were to be hit by a car. So the fist-sized collar went on. Bridget is a confident dog, and didn’t think twice about the ramifications of the power zap. We first learned that she breeched the fence when we heard her shrill eardrum-piercing yelp—something our parrot immediately picked up and began repeating, just to make us feel especially guilty. it’s been eight years and we still have not figured out how to completely contain the dog within the parameters of our home, and I don’t suspect we’ll ever be able to. One of my pet peeves about the dog that really gets under my skin. The other thing about Bridget’s latent dominance—which we whipped into submission for the most part, or at least where it counted, with humans—is her obsessive need to bark at everything that moves or might think about moving in the next day or so. She barks at garage doors, doorbells, doors opening and closing, headlights beaming down the street, leaves blowing, squirrels skittering, cats moving, parrots flapping, and just about anything else you can think would prompt a bark. Bridget barks so much that our parrot, Graycie, yells at her to stop barking. In my voice. And try as we might, those two untenable behaviors are absolutely intractable with the dog. Thus are my (very strong) pet peeves with Bridget. Because I mentioned Graycie, let’s head on over to the parrot now. Graycie, an African Gray parrot, was a surprise gift from a relative who was living in Africa back in the 80’s. I call her the gift that keeps on giving. If you don’t have a pet bird I urge you to consider long and hard before taking one under your, uh, wing. Birds are a lot of work and birds don’t want to be kept as pets. They want to fly in the air and enjoy their wild birdie lives, even if it means being inhaled by a green mamba after a few short months, rather than living in captivity for three decades. Birds poop. A LOT. those little bodies take in a lot of food, and seemingly excrete even more. The intake to output ratio on a parrot has gotta be 1:100. Birds are reeaaaalllllyyyy messy. So first off, trust me, don’t do the parrot thing unless you’re ready to clean up a lot. All the time. And if you decide you do want to do that, I hope you end up with a less-hostile parrot. Because that is the biggest of my peeves with my parrot—the fact that her modus operandus is to wound me as frequently as possible. You might notice the vengeful glint in her eye in this picture. I know this look—it’s the look that tells me I’d better keep all digits far far away from her impressive reach, because she is out for blood. It’s a wonder I have any fingers left, she’s latched on with intent to maim so many times. She’s pulled my hair, bitten my fingers, arms, neck, anything nearby. 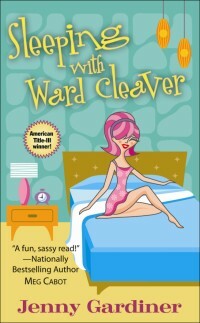 Her saving grace is her amazing mimicry, which when we least expect it, has us buckled over in laughter. And then there’s Sassy, our resident billy goat/Labrador retriever. She was my birthday dog when I turned 40. Sassy has plenty of charm and is generally quite a cooperative dog, which helps. But she has this niggling problem that has gotten wayyyy out of control since she had puppies a couple of years ago. You see, we had a Labrador retriever with dreadful allergies years ago so when we got Sassy we decided to put her on overpriced locally-made holistic-type dog food with the hopes that healthy eating would prevent these allergies. I know, sounds insane. But the last dog we had to put on Prozac because her obsessive itching, scratching and gnawing were causing open sores all over her body and she reeked to the high heavens. So we put Sassy on broccoli-type dog food. Good for you, but blech. Poor Bridget had to make the transition as well, and went from what we assumed was potato chips for dogs to broccoli and she was none too pleased. But they finally got used to the food they hated and life was good. But then Sassy had puppies, and a nursing dog needs to eat an incredible amount of food. The vet had me cooking chicken, vegetables, ground beef, grains, you name it. Twelve, fourteen cups a day! Sassy was a very happy dog. But then the nursing ended and she returned to the broccoli nuggets, which wasn’t cutting it for her. So she took to scavenging our vast backyard for deer poop, fox poop, probably even an occasional coyote poop. So now she has cadaver breath. And the nasty mainstay of her diet (my vet claims it’s caviar to a dog) seeps into her system and out her pores and she walks around fat and happy but stinking like a trash pail. And when Sassy’s not eating random yard poo, she tends to get into the recycling bins and eat aluminum cans, plastic bottles, and yes, even the bins themselves. Once she ate the checkbook. Sassy’s a cute, friendly, easy kinda dog. But she has her moments. Which brings me to Sushi. 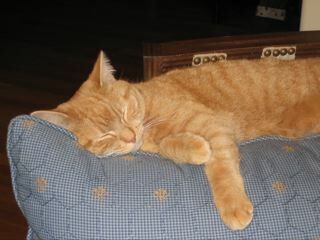 Our (so far) lowest maintenance resident and all-around cool cat. Only complaint we might have (and it’s only my kids’ complaint) is she’s a fabulous mouser. I never witnessed mousing first-hand till we got Sushi, and it’s pretty fascinating to watch her toy with small rodents for hours before the creatures’ ultimate demise. It doesn’t really bother me because she’s keeping the mice out of my basement, which is fine by me. Her only other issue seems to have subsided in adulthood. She used to end up with frequent “retreat” injuries—gaping wounds in her hind legs and dangling hind claws, as she’d be fleeing from a more aggressive cat. This meant plenty of vet visits in her early days. But now Sushi does her thing: she wanders outside by day, comes in to lounge on her favorite chair at night, eats minimally and doesn’t really even bother with a litter box. She lets me do little kitty mani/pedis on her without even a meow. Plus she’s delightfully void of dog breath. Despite our occasional peeves, our lives are so much more colorful with our beloved pets. And they sure beat pee on toilet seats and knobby, rubbery hamburgers. Thank you Jenny for the insight into your Pet Peeves. As you know, I have a few my own (torn up carpet, couch, eaten purses, an entire Costco sized bottle of Tums consumed, resulting in frothy poo, my own beak shaped scars, etc). But like you, I recognize my life is so much better with my menagerie, warts and all. And wait a minute – you’re over 40??? Wow, Jenny. My one little pooch is sounding pretty easy! Frothy poo…I can only imagine! My friend’s lab recently ate a Sam’s Club size bag of Hall’s cough drops, wrappers and all. I’m thinking that might help Sassy’s poo breath though! I hear ya on the beak-shaped scars!!! I saw a parrot on vacation with a beak 3 times the size of my bird, I shuddered to imagine how THOSE bites would feel! rather than taking off a finger, that thing could snap off an entire hand! Yowza. You’ve got a real Noah’s ark going over at your place. Love the pictures. We’ve been bugging my DH for another dog to join our American Eski, I now remember and understand why he is adamantly against it! My son and his wife just got two little kittens> I suspect this is a fabulously brilliant plan on her part to train him to accept messes and craziness more easily in preparation of the GRANDCHILD she will eventually give me LOLOL. LOL_-you just keep telling yourself about that grandchild!!! Oooh, Jenny…so many breathing things under one roof! I would not survive, not would they. As for the toilet seats, the latest gross thing at my health club is I’m finding those flush away paper seat covers aren’t flushing away so there I am kicking it down. If I find the culprit she is in big trouble! I love reading about your pets! I can so, so relate to Bridget’s barking, as my dog also is an expert and near-constant barker. At everything. Also, it’s been probably six or more years since I ate a hamburger, but I vividly remember those knobby little bits. Cartilige…mmmm. Ha–Barbara–never quite thought of it like that, all those breathing things under one roof…The toilet seat cling–also unpleasant, isn’t it? Jess–the barking is insane isn’t it? 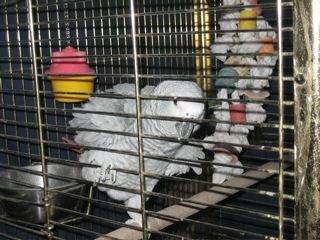 We call Bridget the Barkaholic…Meanwhile my nuisance bird is currently plucking on the cage trying to get attention. Calgon, take me away!!! But I share your pee on toilet seats pet peeve. I mean, if you refuse to sit down, then have the decency to wipe what you sprinkle!!!! Pee on the toilet is the WORST!!! So gross!